High performance can be used in conjunction with high drain film cameras such as Phantoms Flex 4k when loaded you are able to pull 200wh from a single battery! Extra high performance contacts have been added which benefits the high performance range, taking the load off existing contacts, this allowing you pull more current comfortably. LED lighting set-ups can also benefit from V-LOK high performance, for being a lightweight setup which is capable of dealing with the demand of today's lighting industry. Built in fuel gauge, thermal protection, short circuit protection, discharge and voltage protection are all still features. 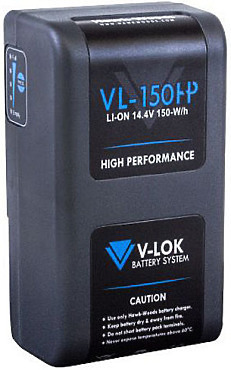 Hire the Hawk-Woods VL-150H 150Wh 14.4v High Performance Lithium-Ion Battery from Procam. Best service and rental rates for the Hawk-Woods VL-150H 150Wh 14.4v High Performance Lithium-Ion Battery and all cameras, lenses, sound, lighting and grip.